A few months ago, I participated in a 10-day Vipassana meditation retreat in Indonesia. When the course was about to end (and we were allowed to talk again), I started chatting with Australian Patrick who was on the same course. When he said he lived in Melbourne, I asked him about interesting places to see near the city. His top recommendation? William Ricketts Sanctuary. Last week, I finally got a chance to visit the place. The hills have eyes, the rocks have faces. A fabulous Australian man-kangaroo centaur. Any questions? 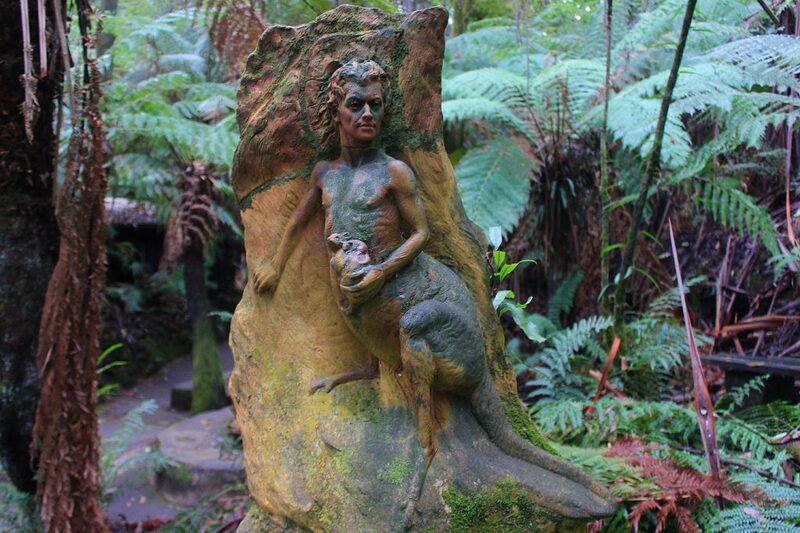 William Ricketts Sanctuary is the main piece of work of Australian sculptor William Ricketts (1898-1993). Ricketts combined Aboriginal motifs and his own beliefs in his intriguing sculptures. The statues of the forested area are designed to blend with the environment: figures emerge from rocks, and the line between natural and constructed is often faded. Ricketts lived in the area from 1934 until his death, and the sanctuary now works as a museum and gallery of Ricketts’ life and art. Entrance to William Ricketts Sanctuary is free of charge, and you can pay 5 Australian dollars (3.4 €) for an audio guide. William Ricketts Sanctuary is open daily from 10 AM to 4.30 PM. William Ricketts Sanctuary is a bit more obscure tourist sight near Melbourne – for example, it’s not even mentioned in the Lonely Planet Australia guide. However, if you want to escape the city for a short day trip from Melbourne, William Ricketts Sanctuary is definitely worth it. 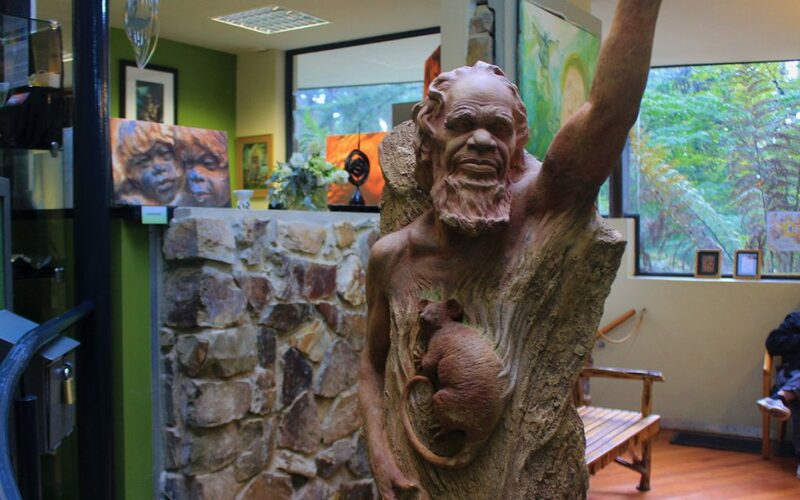 The info center of William Ricketts Sanctuary includes a tiny souvenir shop. 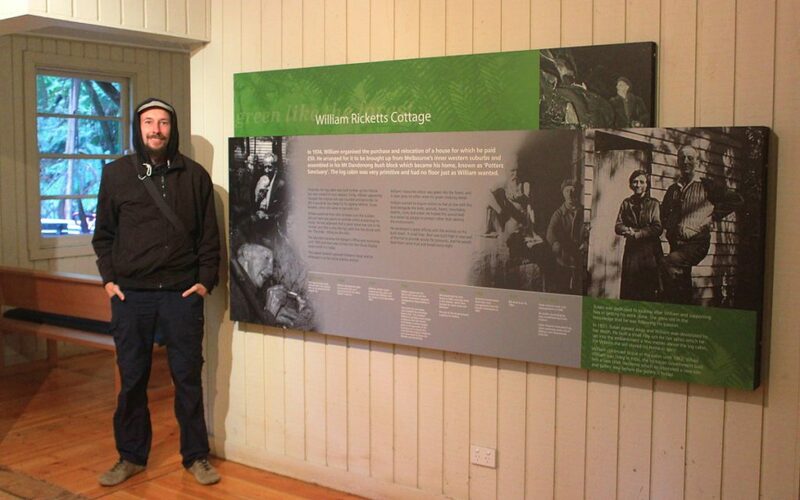 Besides the footpaths, you can explore two cottages of William Ricketts. 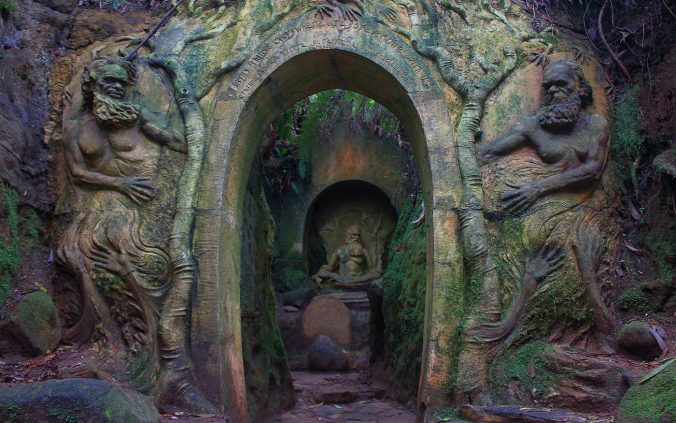 William Ricketts Sanctuary is located in Mount Dandedong, Victoria. The sanctuary is located about 45 kilometers east from the center of Melbourne. 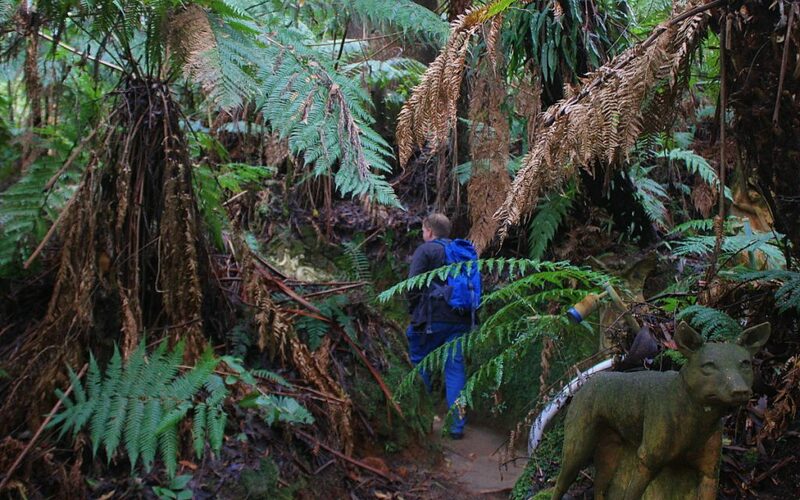 Besides the sanctuary, the Dandenong Ranges offers plenty of hiking routes on the hilly region. You can easily get to the sanctuary and back by public transport. First, take a regional train to either Croydon Station or Upper Ferntree Gully. From either train station, hop on bus 688 that travels between the two destinations. William Ricketts Sanctruary has its own bus stop on the way at Mt Dandedong Tourist Road. 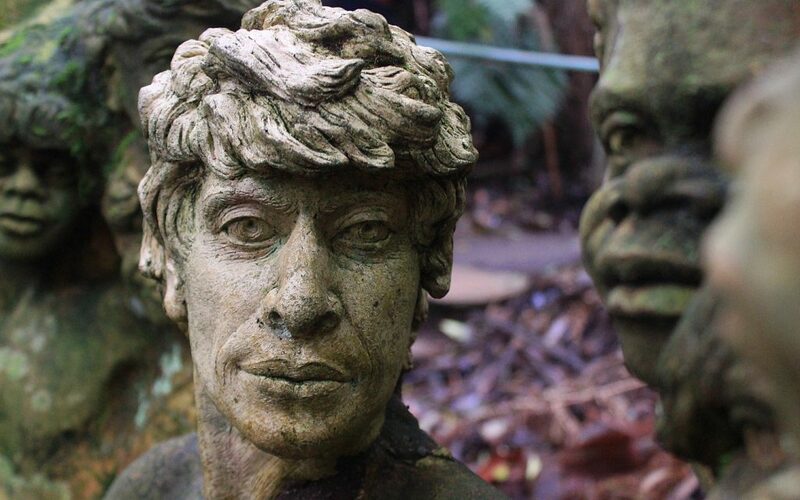 The whole journey from Melbourne to William Ricketts Sanctuary takes 90-120 minutes. You can experience most of William Ricketts Sanctuary in less than an hour. When it’s time to head back, take the next bus to either train station – the bus goes to both directions approximately once per hour. The info center of William Ricketts Sanctuary can check the timetables for you. The journey to William Ricketts costs 4.10 AU$ (2.8 €, 2 hour Zone 1+2 ticket) one way. …but some characters resemble William Ricketts himself. William Ricketts Sanctuary is not a massive place. The whole sanctuary fits inside 4 acres, which is about the size of two large football/soccer fields. However, once you get in, the sanctuary feels larger. There are numerous small pathways between the trees, and almost a hundred sculptures are spread around the area. 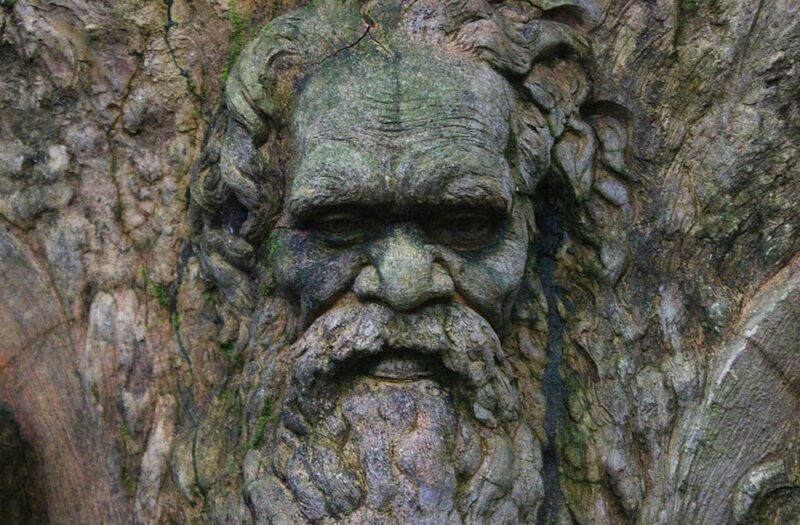 William Ricketts Sanctuary offers well-presented information about Ricketts and his work. At the same time, the signs leave enough for imagination. Some spots feature Ricketts’ own explanations carved in stone, but his “train of thought” type of pondering might leave you with more questions than answers. William Ricketts himself had European heritage, but he spent a lot of time with the Aboriginal people of Central Australia. Besides Aboriginal themes and his own beliefs, Ricketts took influences from different world religions. In this sense, William Ricketts Sanctuary reminds me of Buddha Park near Vientiane, Laos. Thick vegetation blurs the distances. 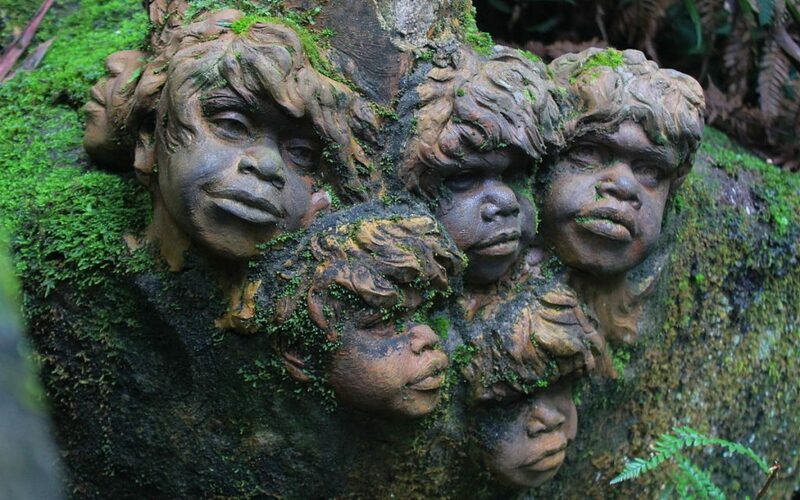 William Ricketts Sanctuary is an intriguing place to explore. The human and animal characters of the statues tell a story that’s not always completely clear, and there’s a great sense of mystery in the air. Many of the details of the sculptures are hard to notice on a first glimpse: the more you look, the more you see. Personally, I recommend that you don’t do too much research on William Ricketts Sanctuary before you get there. This is also my reason (or excuse) for having so few photos in this post. Don’t look for too many pictures, just get there and experience place for yourself. Thanks for your post about getting to WRS via public transportation. It’s great to read a ‘real’ blog post about travel Melbourne like yours. The search result for travel Melbourne have been so saturated with articles trying to sell tour packages to first timers like me. I assume if I am going back to the station from WRS, I should take the bus on opposite direction? Yes, if you want to get back to the same regional train station, you can take a bus to the opposite direction. However, buses to either direction will take you to a local train station. Croydon Station is in one direction, and Upper Ferntree Gully is in the other. The distance to either train station is about the same, so we just took the one that left first. The bus timetables are printed at the bus stops, and the worker at WRS should also have them.